Its coming up on Pumpkin and Scary Mask time once more as the year moves ever closer to its end. On that note yesterday saw the launch of Alternative Armies new set of deals and offers so set your face to spooky and let's see what we have! ClearHorizon Miniatures is proud to offer the printed Gruntz 1.1 Rulebook! We now have the Gruntz ver 1.1 rulebook in stock and ready to ship. We are also offering it at the lowest price anywhere for $18.00. 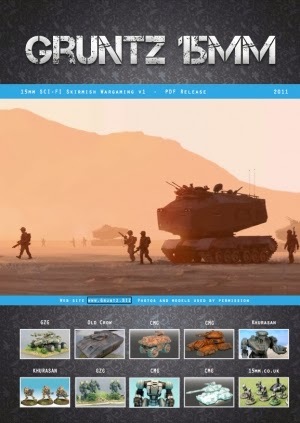 Gruntz 15mm SCI-FI is a dedicated 15mm fast play wargame designed for skirmish level play using combined arms. You can use miniatures from any 15mm SCI-FI manufacturer and the rules are not restricted to a set genre or background setting. You can pick up, learn and play Gruntz quickly and add to the basic rules with the included optional rules with more advanced movement, turn sequence and activation. This is the 1.1 release of Gruntz which has over a year’s worth of feedback and tweaks completed based on player feedback and further test games at conventions and with active players. For the first time it is also now in print which you can purchase from the Wargames Vault. There are new art works by Jake Parker in this release with story intro's to the various factions written by award winning author Jennifer Brozek. I was glued to reading the story intros, they a great little sci-fi reads although you don't have to use the background information in the rules and can use your own settings and scenarios for your games. The rules were 88 pages long in v1 and have grown to a 135 pages with full colour examples, photos and map guides to play in this latest release. Gruntz has a points system and scenarios with unit builders for each type of vehicle and unit in the game. If you enjoy creating your own weapon payloads for tanks and mecha you can make use of the blank profile cards when creating your perfect unit. Gruntz 15mm has been specifically designed to support tanks, support vehicles, air support, mecha and artillery. Vehicle rules are integral to the game and not a bolt on. 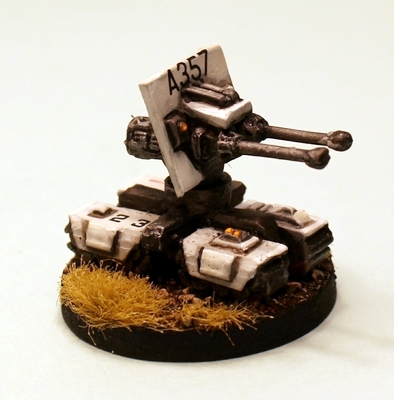 It is a combined arms gaming experience with support for all manufacturers of 15mm sci-fi and modern figures. The rules and statistics in Gruntz cover modern and futuristic technology, allowing for low tech and high tech mixed battles. Included are statistics for alien technology and an introduction to the Heliopause setting. You can build your own forces with the army builders and supplied blank profile cards. This enables any new manufacturer models to be designed and built with statistics which suit your own army with a points system which can be used or ignored if you prefer scenario driven story games. Gruntz 15mm uses D6 die for rolling shooting and attacks with the core mechanic based on a 2D6 roll adding a number from the unit’s statistics. Official counters are available for the game to enable easy identification of conditions on the battlefield.